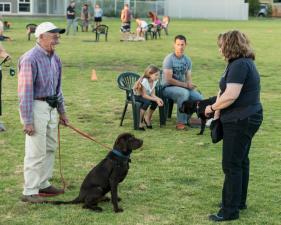 Take advantage of our 20 years of experience to help you learn how to train your dog. There is good evidence that training your dog improves your dog-owner relationship. A trained dog is a valued dog and it’s never too late to learn. Give it a go; most people find dog training is enjoyable and fulfilling. For puppies from 8 to 14 weeks, we recommend first enrolling in our Puppy Preschool classes to help raise puppies into well-behaved adults. For dogs over four months of age, it’s important to know how to socialise young dogs but the best thing to do is to enroll with a good professional dog trainer. We prefer to use the phrase “dog training” these days, but whether you want dog obedience advice or want to find a good dog trainer, we can help. For most dogs, Positive reinforcement training (force-free training) work best and is easiest to do without accidentally causing harm. The Canine Behavioural School is a local, professional group working at Walkerville Oval (24 Smith Street) on Monday nights. Their instructors are highly trained and committed to positive methods. We can vouch for their abilities and results. Canine Interaction at Croydon are another excellent local training group with a similar ethos. There are plenty of other force-free dog trainers and schools. Follow the link to find one near you. Then there are all the amazing and advanced activities such as Flyball, Beagling, Agility, the list is huge and only limited by your time. If you are having behavioural problems or concerns with your dog, we recommend you book a consultation with a vet first. We will ensure the problems are not being caused by a physical ailment, for example, one causing pain. Then we will recommend the best person based on the nature of the problem and your dog’s temperament. Choosing a dog trainer, behaviourist or behaviour specialist is as much about your dog’s personality and we can advise you which method will suit your dog. We can offer other consultants for specific or advanced problems including veterinary behaviour specialists when needed.